Imagine a beach golf vacation to a course so secluded that it can only be reached by passenger ferry or private boat. You can find this vacation a short distance from Myrtle Beach, South Carolina and Wilmington, North Carolina. The Bald Head Island Golf Club is a club that is golf-oriented, there are no cars (only golf carts) permitted on the island. This 18-hole seaside golf course winds its way over dunes, around lagoons, along the ocean and through a maritime forest. George Cobb designed the course, and for 20 years was the lead consultant at Augusta National. Cobb left much of the terrain the way he found it creating an original course of almost unparalleled wild beauty. Many of the holes are so undisturbed, so that they only border the lively natural habitats of herons, egrets, foxes and alligators. Golf Course Architect Tim Cate renovated the course in early 2010. Cate worked to move the course closer to the original George Cobb design. He built in environmental enhancements to have the course blend more seamlessly with the island’s natural environment. He simplified routine maintenance, and made operational improvements. 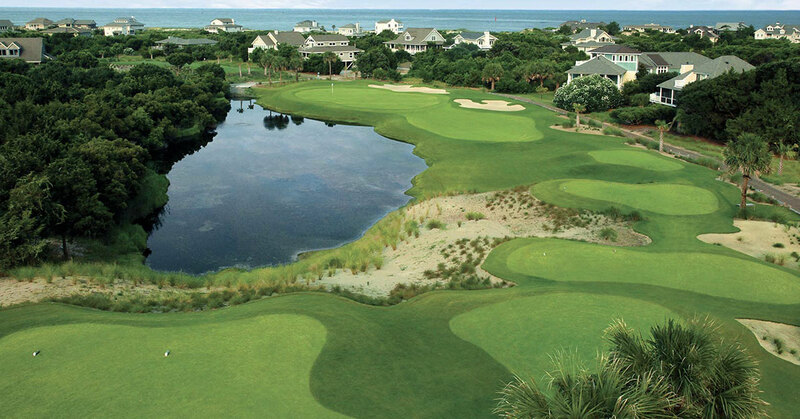 Cate also partnered closely with the Bald Head Island Golf Club, reworking the golf course to take better advantage of the property’s natural topography and assets. As a result, ten holes were entirely renovated and eight others were slightly altered to become more playable and more strategic. Every tee, green complex and bunker was newly constructed to meet modern-day standards. The fairways were re-graded and re-sodded. Finally, they installed a state-of-the-art irrigation system around the greens, including some tees and fairways. By May 22, 2010 all 18 holes reopened for play. The Club features a modern clubhouse and golf shop with a variety of men’s and women’s apparel and equipment. After your round of golf, enjoy a delicious meal at the club’s restaurant and a refreshing drink in the lounge. Awarded a coveted 4.5 stars from Golf Digest’s Places to Play.